Arrowhead 1x3 Steel & Marble Herringbone Mosaic. SOLD BY BOX OF 10 TILES / 8 SFT. 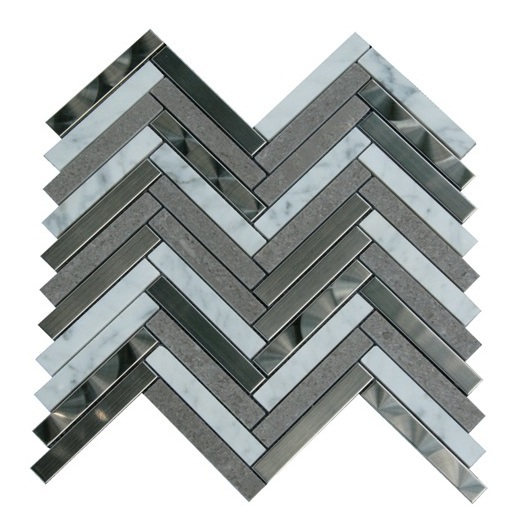 Stainless Steel & Marble Blend Interlocking Herringbone Mosaic are one of the most stylish wall and floor cover that you can use for decorating your bathroom and kitchen, with it's modern contemporary look, designers nowadays used this pattern mosaic for their high end projects in order to achieve the client's special requirements. This product gives me the shine I wanted. I will be able to tell you more after it is installed, but I'm sure I will like it. I went through a lot of samples before I picked one and this was it!!! You just know when you find the right one, the one where you say "WOW"